Amna Tariq is a Water Resources Engineer in the Water and Climate Change Science Division at the Credit Valley Conservation. 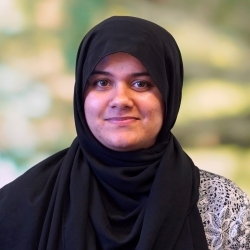 Since joining CVC in 2010, Amna has had an evolving role, initially responsible for managing a variety of low impact development projects, where her tasks included design review, hydraulic/hydrologic modelling and performance monitoring. Amna now works in climate change research and development, which includes tackling new and emerging impacts from climate change on water resources and water infrastructure. Her key interest is in developing technical tools which address these impacts with the purpose of streamlining climate change risk and vulnerability assessments and building flood resiliency.